The weather forecast of Force 0 on Saturday and Force 4 on Sunday for the Crewsaver-sponsored Laser 2000 event at Weir Wood SC couldn’t have been more accurate. The race officer wisely decided not to start any races on Saturday as there was no consistent wind across the course, allowing competitors to watch the rugby, drink tea, have a gossip and organise barbecues at the club instead. Mid afternoon saw an impromptu sail setting training session by Rob Burridge, the weekend’s race officer. A crowd of interested sailors gathered round one of Weir Wood’s club boats to be shown how the different controls affect the sails, listening to advice on general sail set. Once finished with the initial 2 sail set (and still no constant wind) Rob moved on to demonstrate basic settings of the asymmetric spinnaker. On Sunday a blustery Force 4 appeared from the east and at 09h45 the first of five races commenced and some superb and close racing was seen at the front of the fleet between Skip and Zoe Atkins, and Mike Hart and Zoe Thesiger of Royal Hospital School. Others in contention were the Bradleys, Hulleys, Paynes and Rodwells. Some powerful gusts and slam-dunk headers caused several capsizes on the upwind legs, with many a mast being muddied and burgees lost. After the start of the third race, the new class chairman, Ian Simpson, managed to fall off the back of his boat after a violent manoeuvre to avoid a collision, leaving his crew to circle the boat while he caught up again. The race officer lengthened the windward-leeward distance for the second and third races to allow space for some fantastic blast-reaches on gusts which were approaching Force 5. 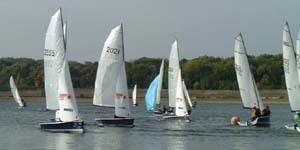 After a well-earned lunch, the two final races were sailed in a moderating wind, which was less shifty and a little easier to read. The newly appointed Class Chairman Ian Simpson presented the Crew Saver sponsored prizes along with those generously provided by Weir Wood SC.